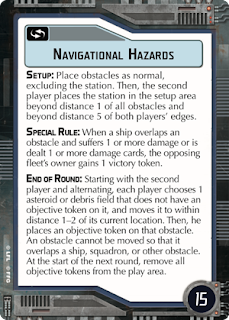 Last time we look at the Assault Objectives, and with the Defensive Objectives not fully spoiled, we are forced to move on to the Light Blue objectives everyone enjoys - so without further ado... Navigation! Here's an interesting objective - you gain points for forcing enemies to crash into moving obstacles. Second Player has the slightly larger advantage here, not only getting to place 4 of the 6 obstacles (including the station at the end) but also gets first choice in moving obstacles, and moves 3 of the 5 each turn. Another key point is the "suffers 1 or more damage / dealt 1 or more damage cards" qualifier for earning a token. That means ships with Chart Officers are able to shrug off 1 bad crunch, Jaina's Light is effectively immune - unless you suffer a "overlap an obstacle or ship, take a damage card" critical. For that matter, that critical would also affect you if you crashed onto the station due to timing issues (I think I read that somewhere, correct me if I am wrong). Second Player: Agile ships is the name of the game here. Your opponent will have 2 rocks they will be trying to pin on you, so being able to dodge them no matter what will be crucial. Raiders, CR90s, Jaina's Light. Ozzel and Madine as commanders. Anything Large base is probably not the right choice. Interdictors can add an extra bonus of bouncing enemy rocks away from your deployment area, or swinging your rocks closer to the enemy's setup. Again, Jaina's Light and Chart Officer help ensure that if something does get in your way, you can take it like a champ without losing points. Navigation orders will probably be important for this objective, so things that can disrupt them like Tractor Beams or Slicer Tools can help you score extra points. Dodonna could be a fun commander if it means getting multiple faceups from asteroid field crashes. First Player: Much the same as Second Player, you want fast, agile ships, and ways of mucking around with obstacles. Interdictor rock displacement lets you play defensively though it does come on a slower ship. Remember that you are at the disadvantage for moving obstacles, so try to force your opponent to make choices of attacking your ships with their rocks, or "wasting" a movement clearing some rocks from around their fleet. Overall Strategy: Interestingly, I think this objective may facilitate squadron play, particularly with Rogue squadrons (got to save the navigation commands for your ships!) Moving obstacles will let you get your squadrons into good places where they can attack without being engaged, or give themselves cover from enemy AA fire, while they bring the hurt to a bomber swarm. Being able to spread out your forces is also a big one here. Not limiting where your ships can go based where other ships are is going to keep you off the rocks. This is going to be an objective that rewards precision flying. 80 extra points on the board, and a lot of obstacles around the station in the middle of the board. 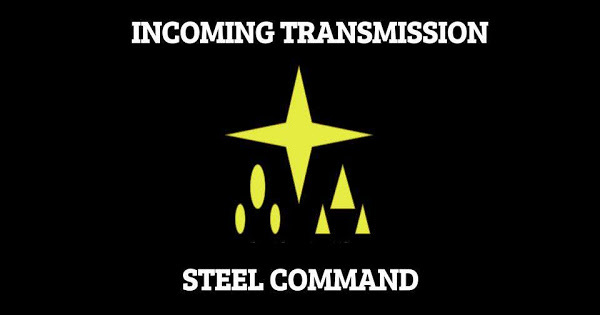 Mechanically, this shares a lot of similarities to Intel Sweep - your ship has to survive to its activation to pick something up, which benefits First Player to a certain extent. Having multiple ships capable of picking up tokens is going to be important as well. Smaller ships will probably be important here to sneak in to the station that is going to be swarming with other obstacles. In the end though, you have a pretty good idea where everyone is going (the station) and when they are going to get there (very quickly) so you also have to make sure you can win that kind of shootout. Second Player: Build to win that shootout. Either bring enough forward facing damage to drop whatever you are driving at, or a very angry flanking force to punish someone who you know is headed right for that station. Much like Intel Sweep, Rieekan is an excellent option for making sure something still alive at the start of any given turn is going to live long enough to pick up the token, whenever you decide to activate them. He can also be used to block enemy ships from even being able to move into range of a token in the first place. Consider GR-75s if you are using him for this purpose - 20 points for 18 points (or so) is a pretty decent trade, especially if you were willing to make that trade anyways. Alternatively, CR-90B's with SW-7 Ion Cannons are always a good time with Rieekan for blocking fun. First Player: Advantage is yours for picking up tokens, and you also need to be ready to win a shootout in the middle. Have an Interdictor ready to clear out a path for your ships to move into the station, or just enough Chart Officers to not care about busting into the fight. Overall Strategy: A big knife fight seems likely at the middle of the map. Make sure you bring the biggest knife. Black dice, fast ships, good obstacle placement, these are all keys to turning the scrum into a win for you. Don't forget that dust fields are there to help keep your smaller ships safe from bigger ships that may be running around the periphery. Winning the scrum in the middle is probably more important than even playing the objective - you have to get ships into the middle otherwise you just give up 80 points - but your opponent is almost certain to have more than 80 points in the middle. If you can farm those points, even if you lose the objective 20-60, you should still come out on top. Another objective that benefits fast, maneuverable, and above all multiple ships. I think this one is a big benefit to the Second Player, as if you set things up correctly, you could set yourself up to collect tokens multiple times in a single round. And with the Second Player's move advantage for the tokens, you can pretty much erase the First Player's scores if played correctly. Second Player: Did I mention the distance advantage you get for moving these things? Distance 1-4 lets you rocket a token most of the ways towards your own fleet, either drawing an opponent in, or setting yourself up to score on the very same turn an opponent did. Note that the token is moved upon scoring the victory token, which is immediately following the reveal of the command dial. If you have a good number of ships in formation, it may be quite impossible for your opponent to move your token away far enough to keep another ship from scoring it as well. I think this objective works very well with the Gozanti swarm that the German national winner showed to such great effect, as it does with a TRC90 swarm of some type. Really, any list within the 4-6 activation range should be able to get some good effect from it. First Player: Remember that you get to see where your opponent moves the tokens after you score them. Use those points to set up death traps for them. Being first to activate gives you the chance to score first and set up an advantageous board state for you. I don't think it matters as much having a large number of activations to pick this one against a high activation list. Rather, being able to destroy multiple ships a turn is the key to making the most of this objective. Gunnery Team ISDs / MC80 Liberties could have a field day tempting enemy ships into a kill zone. Overall Strategy: Keep an eye on not overextending yourself trying to play the objective. Don't be afraid to toss the token away into the middle of nowhere, even if you won't score it, if it means your opponent won't be able to either. Don't get suckered in by 15 points of token, if it is your opponent setting up a trap. I don't see this benefiting squadrons in any particular way. Come at them out of the sun! The attacker must discard 1 die with an Accuracy icon if able. Now this does happen before any other effects on the attack pool, but you could wind up with a scenario with Cracken TRC90s coming out of the sun at speed 3, having your foe lose 1 for obstruction, then 1 for rolling an accuracy, and already be 2 dice short for his long range attack. If he only had 2 dice to begin with, this doesn't cancel the attack exactly, but good luck adding any dice to your attack pool that require other dice to be in your pool. Like say, a concentrate fire? Oh, and it works with squadrons taking AA fire as well. It's not a huge boost by any means, but it can add up. Second Player: Got a list that doesn't like Accuracy Results? Can hardly blame you for bringing this along. It may result in you ironically hoping for accuracy so that you can drop a die, especially if it is a ship where only one die can get that result (looking at you, GSD2). Plus, you get all the benefits of deploying after your opponent, but without the Superior Positions objective issues. 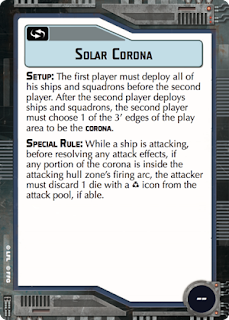 Though this will likely be more difficult, as your opponent can cluster in a corner, and dictate to a certain extent which side the Corona is going to be. Still, a strong, strong benefit that might outweigh the Corona itself. First Player: I guess this objective is another reason to bring your H-9 Turbolasers, Home One, Jonus, and Sensor Teams. 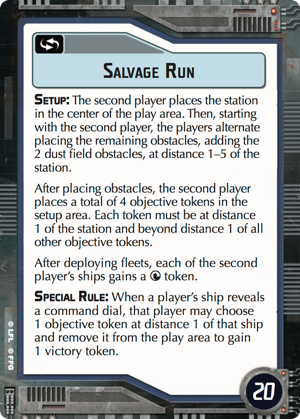 It is also ships only, so feel free to go hog wild with squadrons on this objective. Agile broadside ships can sneak past the Corona's effects and turn the table on Second Player. Overall Strategy: Keep your back to the sun, and if that fails have some way of generating accuracy results if you need them.